Not sure what plants to use in your landscape? 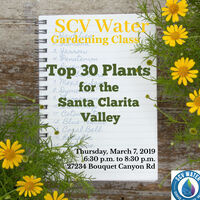 We’ve taken the guess work out by identifying the top 30 plants that look beautiful and grow well in the SCV. They’ll make a great addition to your landscape!